Google's Penguin Update & The Confusion On Going "Deep"
Home > Google News > Google SEO > Google Penguin 2.0 Goes Deep - But What Does That Mean? Google Penguin 2.0 Goes Deep - But What Does That Mean? 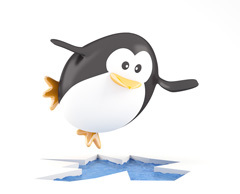 As you know, Penguin 2.0 #4 is live and webmasters and SEOs are buzzing about that. The thing is, some misconceptions about Penguin 2.0 are driving me absolutely crazy. Matt Cutts, in his video about this update, talks about how Penguin 2.0 will be "more comprehensive," how this version "goes deeper" and will result in "more of an impact" than Penguin 1.0. The SEO community is translating "goes deeper" to mean that Penguin 1.0 only impacted the home page of a web site. That is absolutely false. Deeper has nothing to do with that. Those who were hit by Penguin 1.0 know all to well that their whole site suffered, not just their home page. What Matt meant by "deeper" is that Google is going deeper into their index, link graph and more sites will be impacted by this than the previous Penguin 1.0 update. By deeper, Matt does not mean how it impacts a specific web site architecture but rather how it impacts the web in general. For example, Ross Hudgens tweeted "Penguin 1 targets homepage, 2 goes "much deeper." I said back no and ended at that. But he and others did not get it. The WebmasterWorld thread has webmasters confused about it also, where someone said "I don't understand this idea that Penguin 1.0 just looked at the home page." You are right, it is completely wrong to think that way. Normally I don't get heated up about misconceptions in the industry - but seriously. Update: I see now where the confusion comes from, via TWIG, right over here where Matt said Penguin looks at the home page of the site. Matt must mean Penguin only analyzed the links to the home page. But anyone who had a site impacted by Penguin noticed not just their home page ranking suffer. So I think that is the distinction. how to add 5 star rating to html page from schema.org?